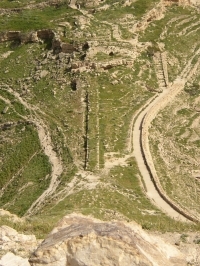 On both sides of the river Jordan, in present Israel, West bank and Jordan, a series of fortresses were built along the edge of the Jordan Rift valley and the deserts. These fortresses have a series of characteristics in common, also in terms of the water supply: they are built on a rising hilltop which is connected to the surrounding hills by a saddle, water being supplied from nearby in a channel via the (raised) saddle and stored in natural caves and/or cisterns. From these cisterns the fortress on the hilltop was supplied by means of man or animal power to bring up the water. permanent storage (and use) inside the fortress. The technologies used were very appropriate to the local conditions. Optimal configurations of the well known basic elements were made to exploit the water resources in the most efficient way: water diversion, gravity flow conduits, conduit bridges, pressurized conduits and/or cisterns. 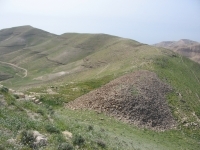 Different types of water catchments were found: diversions of run-off water from wadi's, collection of run-off water from local hill tops or capture and conveyance of spring water. The length of the conveyance canal was mostly between 500 - 1200 m with exceptions such as Hyrcania (12 km) and Kypros (14 km). Different types of structures ware used to overcome the depressions to the fortresses: a dam, bridge or wall and in Alexandreion a masonry siphon of 190 m length and a lift of 110m. Intermediate storage was realized in 4 - 14 cisterns per fortress up to 38.000 m3 (in Masada). 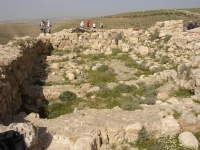 So Machaerus is one of those dessert fortresses, located at the southern border of Peraea where it met the territory of the king of Nabataea. In the case of Machaerus not all the basic water supply elements are known. 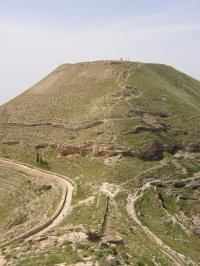 One supposes that the water was collected by means of diversions from two wadi's, led into a conveyance channel of unknown length, via a wall over the saddle to 6 cisterns for intermediate storage and lifted by man and animal power to the hill top (700 m above sea level). The best visible remains of the water supply in Machaerus are the foundations of the wall on the saddle and some of the cisterns half way the hill, on top of which some remains of Herod's fortress are visible including a huge reservoir. It was Herod the Great's son Herod Antipas (4 bc - 39 ad) who ordered the imprisonment of John the Baptist because of Johns criticism on his marriage to his brother's wife Herodias (Luke 4 vs 19). During Herod's birthday party Herodias suggested the beheading of John (Matt 14: 1-12). 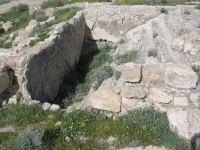 According to the historian Flavius Josephus the imprisonment, the party and the execution took place in the fortress of Machaerus. Like Masada Machaerus had a garrison of Roman troops during the the First Jewish revolt. In September 70 AD, after a seven month siege, Titus captured Jerusalem. 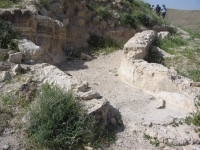 The Jewish cause was hopeless but groups continued to hold some fortresses among which Machaerus. It was assaulted by Lucius Bassus at the head of a force which inclided the Legio X Fretensis. This Roman commander erected an entrenchment of some 3 km with an army camp and 10 - 11 watchtowers - the remains are still visible in the landscape. He captured the fortified hilltop by building a siege ramp on the ridge of the hill west of the fortress (see photo below). Before the ramp reached the fortress the besieged Jews capitulated and were allowed to leave. 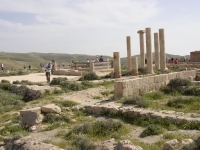 After this victory the Jews at Massada experienced a similar siege (Spring 74 AD) but committed collective suicide rather than fall into Roman hands.